Annually at Mipham Shedra, Lhoppön Rinpoche guides us in the practice of “Vajrakilaya” four days before Tibetan New Year, to purify obstacles, delusion and negativity that sometimes arises in the lives of dharma practitioners. This enables students to enter the upcoming year cleansed, refreshed and renewed. 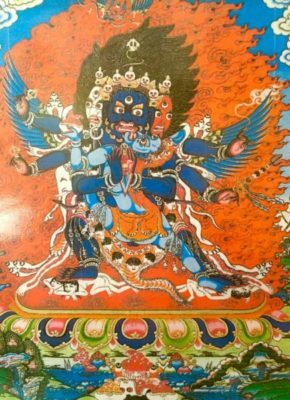 As a wrathful Heruka full of compassion who embodies the “enlightened activity of the mind” of all the Buddhas, Vajrakilaya is at the core of Vajrayana for destroying energies hostile to compassion and purifying pollution which may prevent practitioners from advancing in their meditation practice. In the tantric system of the Nyingma tradition there are three principle meditational deities; Phurba, or Vajrakilaya, is one of these three. Vajrakilaya is practiced by followers of all the Tibetan Buddhist traditions and both the 13th Dalai Lama and H.H. the 14th Dalai Lama treasure Vajrakilaya as their yidam deity. Vajrakilaya, one of eight Heruka teachers inseparable from Primordial Buddha Samantabhadra, taught the teachings of the Sadhanas of Kagye’. These teachings were written in scripts and placed in eight caskets. One of those, a turquoise casket containing the “Tantra of the Phurba,” was given to Vajra master Padmasambhava at the Deche’ Tsekpa Stupa, in the presence of the great Dakini Le’kye Wangmo. Padmasambhava was instructed to practice these teachings and transmit them to others. From Padmasambhava’s original transmission of Vajrakilaya instructions, three traditions resulted. Our specific practice at Mipham Shedra comes from the “Tradition of Jomo,” from Padmasambhava’s Tibetan consort, Yeshe Tsogyal. The “Tradition of Jomo” was found in a Treasure buried by Yeshe Tsogyal and later discovered by Terton, Ratna Lingpa. Vajrakilaya is known in the West by Tibetan Buddhist practitioners, however the sadhana is complex, and the details crucial for correct understanding. The month before Losar Lhoppön Rinpoche offers classes during public meditations on the practice of Vajrakilaya. This prepares the Mipham Shedra sangha to practice with greater understanding. We invite you to join us in these preparation classes and in the four day practice of Vajrakilaya. May all obstacles be removed, may all sentient beings be blessed by our Dharma practice.